We went to hog on the hand-made ice cream at the oldest ice cream parlour in the city and came back happier. Finding Taj Ice Cream in the middle of the Bohri Mohalla near Muhammad Ali Road is like finding an oasis of taste. 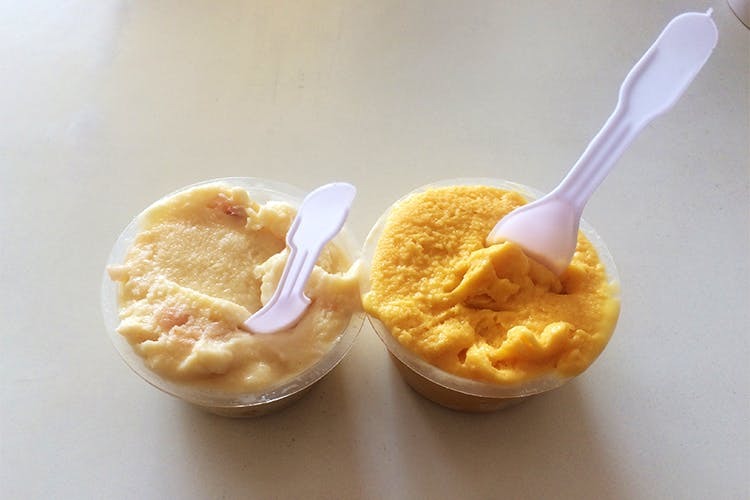 While the surroundings do have you small-scale eateries, Taj Ice Creams has kept up with the times. In operation since 1887, one cup of their hand-made San-Cha ice cream will cost you INR 60. The ice creams are an absolute delight to our tastebuds. A little on the creamier side, these hand-churned ice creams are for anybody who eats their food slow, thanking each bite that goes into their mouth. Honestly, nothing. It’s for people who don’t mind the occasional nudge from the mohalla people, people who appreciate the smaller joys of life and are open to the sun staring them in the face. It’s near Muhammad Ali Road, so be prepared to walk a few metres and loud horns. Basically, prepare for chaos.